I grew up in Reno, Nevada amid the casino lights, Sierra Nevada mountains, and vast desert land. However, I currently live in San Francisco surrounded by water, fog, and the bustling noises of an urban city. I am a west coast gal, meaning I love seafood, 60 degree weather, and the laid back nature. I balance my time serving a church as a co-pastor, subverting my husband’s diet with baked goods, cheering on my son at soccer games, delighting in my daughter’s unique displays of being herself, and dutifully obeying my dog’s daily demands of being walked, petted, and adored. I graduated from McCormick Theological Seminary in Chicago with awards in preaching and theology. Before coming to St. John’s Presbyterian Church in 2003, I completed a full-year chaplain residency program at UCSF Medical Center, where I continue to volunteer as a baby cuddler and serve as a member of the Professional Advisory Group for Spiritual Care Services. 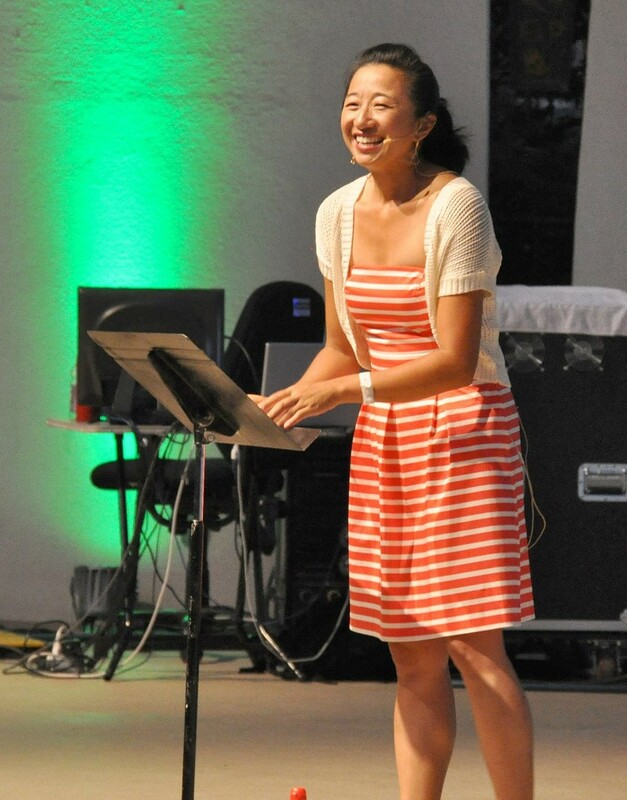 I love to teach and therefore have keynoted, preached, and led workshops at a variety of different conferences: youth, women leadership, peacemaking, and worship. I am currently working on my Doctor of Ministry degree at Fuller Theological Seminary in Pasadena, focusing on leading congregational and organizational change. I love to write and have published articles and written blogs in Christian Century, Sojourners God’s Politics, Christians for Biblical Equality, ecclesio.com, the Presbyterian Leader, and other blog sites. I love to bake – partly to justify having a degree in chemistry and partly to tap into the creative side of decorating. Mostly, it helps me let go of intended outcomes when the cake doesn’t come out perfectly and fully celebrate when they come out just as I had hoped. Thanks for your article and just wanted you to know that I read it. I have to communicate to you this way as I have been kicked off Sojo. Guess it is OK for their authors to be on the edge as well as more liberal bloggers. As a conservative – guess I am expendable. When I asked my mother why they named me Randal, she told me they got it from the Bible. Someone must have written it in the margins somewhere of her Bible. Thanks for sharing your creative ideas. First, thanks for all that you post and share so freely. I really appreciate your insight and creativity. I have been particularly interested in your prayer stations for toddlers as our church situation (I am the pastor of a small Pres. church in MA) is similar to yours in some ways. I am hoping to do prayer stations around Worldwide communion and the peacemaking offering on Oct. 2nd and I was wondering if you had anything you had done that you would like to share 🙂 or ideas that might work. I would really appreciate it. Thanks. Scroll all the way down where you see toddler stations – activity one: about feeling bread at different stages and tasting different breads around the world. Thanks so much for this and thanks again for being so generous with your creativity! Theresa…you once wrote an article about some of the experiments that you were doing at Presbytery Meetings in SF…where can I get a link to that? Just stumbled upon your blog today. I like how you think. God’s peace to you. Thank you for sharing your good words of hope at Synod School this past week. Enjoyed the stories as they painted pictures in my mind, and found your messages comforting and challenging at the same time. Blessings on you in your vocation, and everywhere. You have come to mind twice this week: once when I rocked my cute jean jacket ala Theresa style and now when I happened on this. I will use these ideas tomorrow night as we kick off Hunger month with our families at Wednesday Faith Night. Thank you for the inspiration. I have thought about you often since I saw you speak at SYNOD school. Keep it up, Lady. You rock. Hi Cathy, some of the earlier posts do have actual stations designed for kids. Over time, I tried to make the stations more intergenerational so that parents can do it with their kids. Looking forward to Toronto as well. Hi Paster Theresa- I want to thank you for posting the script for your Christmas Pageant. We plan to use it this year after a lower than usually voluntary participation from our young people. We are modifying it to use the children who have signed up as the cast and having some older children narrated. You have saved our Christmas Pageant tradition this year. Thank you for sharing your script. Happy holidays. I am hoping to find one of Kirsten Malcolm Berry’s prints of the 2 Fishes & 5 Loaves – like the one on your prayer station. Kirsten has sold all her prints and I’m interested in finding one in the secondary market. Do you by chance own one and if so, would you have any interest in selling it?